There are oodles of adages associated with "when pig fly": events extremely unlikely to occur or just plain nonsensical. 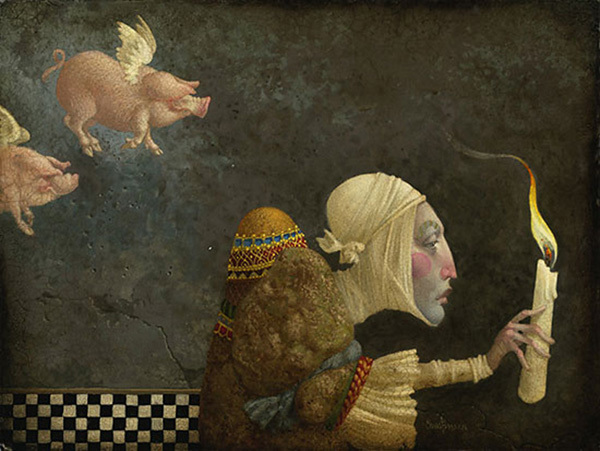 In the world of artist James C. Christensen, a flying pig might seem perfectly commonplace. But the hunchback holding a candle in If Pigs Could Fly is oblivious to his winged counterpart. In Christensen's art, the hunchback represents the imperfect "everyman" and the candle he carries signifies his wisdom and faith (or the faith in his wisdom, as the case may be). Our hero forges onward, walking ahead, not expecting the unexpected, nor noticing what's happening just over his shoulder. If Pigs Could Fly reminds us that anything and everything is possible, and not to eliminate any possibility.